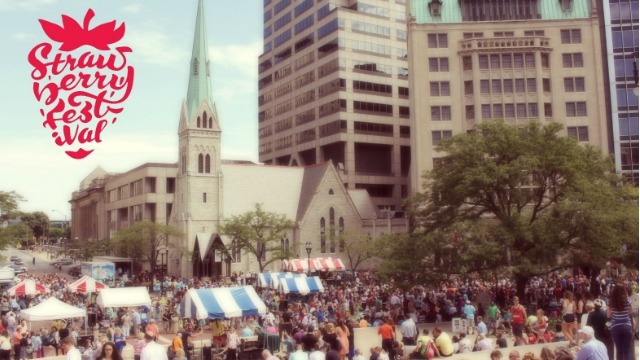 Join Christ Church Cathedral, that 'Church on the Circle' for an Indianapolis tradition! Carry out begins at 8:30 a.m., entertainment starts at 10 a.m. The festival ends at 4:00 p.m. or until we run out of supplies. Over 95% of all Strawberry Festival funds go directly to grants in Indianapolis, our country and our world! The First Annual Strawberry Festival was held on Thursday, June 10th 1965. The festival was the idea of parishioner Pat Harding and Nate Gore, who suggested the church host a strawberry festival, such as they had back in her hometown of Lymington, England. With Nate Gore, Church Sexton, the Cathedral Women thought they could both raise funds and have some fun. Christ Church Cathedral has a long-standing tradition of raising money with sweet, summery berries. In Eli Lilly's book, The Little Church on the Circle, he documents how CCC has been raising funds with strawberries since 1864. "The young ladies of the Christ Church Bible Class took advantage of the early summer season to give a successful strawberry festival at Masonic Hall (admission 25 cents). Over $250 was realized, which was applied toward the liquidation of a small debt still pending against the church." As noted in the Indianapolis Daily Journal, June 13, 1864 pg. 3 col. 1. Join us on Thursday, June 14th 2018 for our 53rd Annual Strawberry Festival! Every year on the second Thursday of June The Cathedral Women of Christ Church Cathedral hold our annual Strawberry Festival. For 2018 the congregation baked 19,879 shortcakes. Over 300 volunteers will come help serve strawberries, ice cream, and homemade shortcakes. Cathedral Women unite the women of Christ Church Cathedral in service, friendship, worship and study. We organize service projects, social outings, and hold four general meetings containing an educational program. Our annual Strawberry Festival allows us to give funds in the form of biannual grants to approximately 30 local and international charities.